Ayushi Mehta, a student of class VIII, had a tough task to complete as during her English class in school, the teacher had asked everyone to write an 'Essay on Generation Gap'. Having no idea what the words meant, she turned to her mother for help thinking that she would certainly be able to help her with the 'Essay on Generation Gap. But sadly, even her mom failed to understand how the term needed an explanation. Well, this isn't about just one Ayushi or her mother. This is the case with every parent and child across the globe. We all talk of Generation gap; the older generation is often heard criticizing the present generation, and the current breed hardly bothers to give ears to what's been preached. And all they blame at the end is 'generation gap', which for sure has become the favorite dartboard for everyone. But what is this generation gap? Do we really have a generation gap existing or it's just the creation of our thoughts? If it's of so much relevance; let us try and figure out what it exactly is. If we have to define it in the literal terms, then generation gap is the difference between thoughts, ideas, behavior and above all, way of living amidst the present generation and the older one. It has been existing since ages and by the looks of it, we do see it enjoying a long run until the gap is bridged. Though it exists round the globe, but is more prevalent in India given the authoritarian parenting style adopted by most parents here. Difference in thinking: Whether it is about eating out, planning a holiday, choosing an entertainment source or for that matter selecting one's clothing type; there is a huge difference that exists in the thinking of parents and kids. 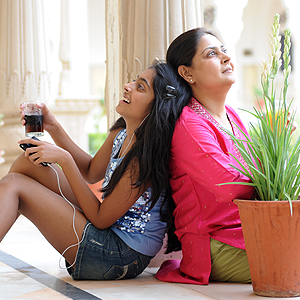 While parents still stick to the age old beliefs, the kids on the other hand swear by the latest technology and gadgets. The Lifestyle: Parents vouch for the deeply rooted Indian culture, while kids leave no chance of rebelling against the age old traditions and customs. They want to live life on their own terms and the slightest of interference from parents, make them feel insecure about their freedom. Society, morals and ethics often appear to them as threat to their free life. Rigidity: Agree or not, but this remains the fact that both parents and kids happen to be rigid with their set of beliefs and ideologies. And sadly, neither of the two wishes to bring in a little flexibility. This rigidity is what continues to widen the gap. Parental Expectation: This is something where solely the parents are responsible. Often we find parents trying to live their unfulfilled dreams through their kids, which apparently makes life a burden, hard enough for the kids to handle. Too much of expectations from parents often lead the kids to rebel when they fail to live up to them. Identity Crisis: Given the age of transition we currently are living in, the teenagers are seen struggling to find for themselves a place in the society. They wish to be recognized by theirs peers, parents and people around. They have learnt from their surrounding, the media; TV, and films for that matter; 'you are cool, if you own the happening things'. Everywhere it is proclaimed, live life on your own terms, do what your heart feels is right. But nobody explains to them what is right, and this is what leads them to an identity crisis which further traps them in rule breaking, bullying, rebuking parents, having multiple relations etc. Lack of Communication: Last but certainly not the least here, lack of proper communication is the main reason that we are today discussing out this topic of generation gap. Communication is not just talking or asking about your child's daily routine or he demanding of any commodity from you; communication has a lot more than what meets the eye. It is more about sharing your thoughts, ideas and at the same time trying to acknowledge and listening what others have to opine. How can Generation Gap be bridged?